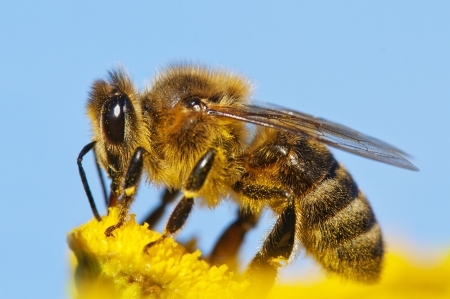 In honeybee colonies, thousands of worker bees are born. Young worker bees care for the brood (larvae and pupae), and then serve as guard bees and later as foragers in the crucial stage of honey production. And foraging is a major step in the honeybee lifespan as it speeds up aging due to the increased stressors they’re exposed to including pathogens, predators, and weather conditions. In fact, how honeybees age depends on a variety of factors, such as the presence of larvae, which reduces bee life expectancy due to adult workers needing to tend them. This was shown, per a University of Bern study, by an increase in worker longevity after researchers removed larvae. Since the removal also resulted in the removal of future young adults, the observed effect could not be attributed to the young workers or to the brood until now. “By experimentally separating the effect of brood and of young adults on their nestmates’ destiny, we could tease apart the role of these two actors,” said senior author Vincent Dietemann. “We saw that both the presence of brood and of young workers shortened the life expectancy of their nestmates,” adds lead author Michael Eyer. Co-author Peter Neumann also added, “These social regulation mechanisms of food collection allow the fast adaptation of the colony to a changing environment.” This study is especially beneficial to beekeepers who practice colony management. The extension of the worker bees’ lifespan allows the colony to compensate for the absence of larvae and continue functioning. These findings are also crucial for insights into social organization in insects—something which often inspires technological innovations for people. A study similar to the University of Bern’s regarding the aging process was conducted by Arizona State University scientists, who discovered that when elder bees assume the roles of younger “teenage” bees, they reverse aging effects. “After just two weeks, foraging bees have worn wings, hairless bodies, and, more importantly, lose brain function — basically measured as the ability to learn new things. We wanted to find out if there was plasticity in this aging pattern, so we asked the question, ‘What would happen if we asked the foraging bees to take care of larval babies again?” said Gro Amdam, an ASU associate professor. To reverse this effect, scientists removed young nurse bees, or “teenage” bees, from the hive to resume tasks they had outgrown. New Zealand Cats Injured by Methylated SpiritsManuka Honey Stir Fry Never Sounded So Good!